...Goulds Pumps & Agriculture Solar Powered Water Pump Power Increases Efficiency, Lowers Costs and Maintenance. Using state-of-the-art techniques in pump design, Goulds Pumps and Agriculture Solar pump line covers a wide range of conditions to meet virtually every pumping service in the industry with optimum efficiency. Goulds Pumps builds on over 150 years of hydraulic and manufacturing expertise to produce the finest pump in the industry. Our line of water pumps and power supply are offered with a variety of options to make them suited to almost any irrigation application. Goulds Pumps is among the most widely recognized and respected brands in the global pump industry, serving customers in the agricultural and general industrial markets. 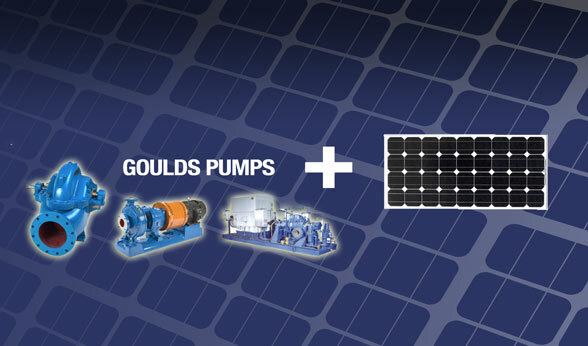 At Agriculture Solar, Goulds Pumps and Agriculture Energies can be your simple solution. As the only manufacturer to make digital monitoring standard on every process pump, Goulds Pumps continues to lead the industry in both mechanical pump design and the adoption of smart technologies. Agriculture Energies systems have been successfully active in the top irrigation fields for over 10 years and continues to bring the tried and true principles and advantages of solar hybrid power. Think about it, and then make your move. Let Goulds Pumps and Agriculture Solar water management provide you with decades of reliability and lasting value. We invite you to explore the possibilities of our reliable hybrid solar powered pump solutions.